These sleek, aesthetically pleasing doors are available in hinged, swing, patio, tilt and slide and fold and slide styles. 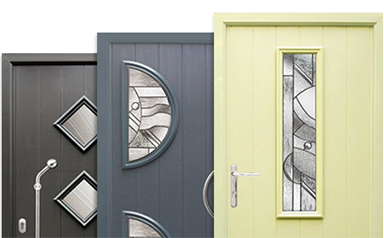 Choose from a wide range of door styles. Design your dream door with our fully interactive Solidor® door builder. "Massive thanks to Guernsey Trade Windows for fitting our windows, in for Christmas as promised! The finish on the frames is exactly what we wanted, and the fitting is excellent! Few more windows to go, we'll be in touch next year!" "Fantastic company excellent work staff are very good would recommend to everyone great service and will always use Guernsey Trade Windows Ltd for all my glass work in the house, massive Thank you!" "Just had some work done by these guys, not one thing to complain about, happy with the quality and work carried out and nearly £6000.00 cheaper than other companies"
"Highly recommend this local company, fantastic work replacing our conservatory roof with the new Superlight one. The fitters are hard working and friendly and Ben & Jerry were helpful all the way, checking as the roof was replaced, answering any questions straight away with no flannel or excuses like you get with some company's, the lads were very clean and tidy as they went and on finishing presented the end product in a immaculate condition"
"We decided to change our existing conservatory glass roof to a Superlight tiled roof system. Guernsey Trade Windows were thousnads of pounds cheaper than other companies and an absolute pleaseure to deal with, the office staff and the fitters were very efficient and the quality of work is second to none, we are absolutely delighted with our new Superlight tiled roof." "We had a traditional style oak building constructed, so we contacted Guernsey Trade Windows who provided us with four sets of glorious aluminium bi-folding doors. The fitting team were true professionals and a credit to the company." "We had seen a previous door installation by Guernsey Trade Windows and decided to apply for planning permission to transform our old single door into a new front porch. We are delighted with the end product." "We used Guernsey Trade Windows for a number of reasons, the main one being they were the only company to offer us a huge variety of products. We now have a beautiful grey aluminium sunroom with two large, contemporary roof lanterns that have transformed our property. We highly recommend Guernsey Trade Windows." "We have used Guernsey Trade Windows for many of our projects; with the highest quality products at the island’s most reasonable prices, we would not use anybody else. Customers for life." "We use Guernsey Trade Windows for all of our window and door service requirements. With a professional and speedy service, we cannot recommend Guernsey Trade Windows enough." "Guernsey Trade Windows transformed our kitchen with beautiful glass splash backs; we could tell we made the right choice as the attention to detail was second to none." Copyright © 2019 Guernsey Trade Windows LTD. All rights reserved.